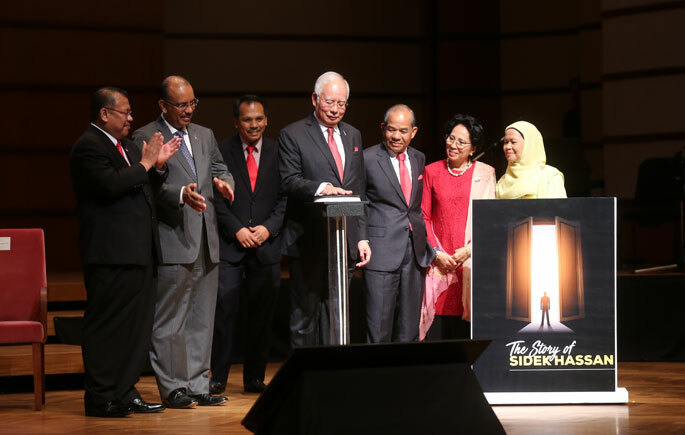 KUALA LUMPUR, 12 March 2018 – Prime Minister, Dato’ Seri Mohd Najib Tun Abdul Razak launched No Wrong Door: The Story of Sidek Hassan, published by UKM Press at Petronas Philharmonic Hall, Kuala Lumpur Convention Centre (KLCC), recently. Written by Dr Rokiah Talib, the book tells of the journey of life and experience of Tan Sri Sidek Hassan, who is the former Chief Secretary (KSN) to the Government. Dato’ Seri Mohd Najib in his speech said Tan Sri Sidek is a very dedicated person over the course of his duties in the Government service. “Tan Sri Sidek is not only an authoritative KSN, but he also a great individual. “I remember when he succeeded in boosting the country in the list of Destinasi Mudah Menjalankan Perniagaan by World Bank in 2007 until 2013,” he said. He said the book also serves as an inspiration to people that being poor is not a barrier to having a successful life. “This was proven when Tan Sri Sidek, an orphan from a poor family in Kampung Paloh, Cherok went on to become the Chief Secretary to the Government,” he added. Meanwhile, Tan Sri Sidek hopes that all government servants will continue to give good services. “For me, a powerful officer is someone who can facilitate the business, not otherwise,” he said adding that generally, it is easier to make things difficult and it’s difficult to make things easy. UKM Vice-Chancellor, Prof Tan Sri Dato’ Seri Dr Noor Azlan Ghazali said UKM through UKM Press was very proud and lucky to be honoured to publish biographies of a very prominent figure in the civil service. The idea of writing the book was initiated in 2012.